Paddleboarding can be a great experience for amateurs who want to enjoy the water or enthusiasts who love the sport. Whether you are new or not, one of the most important equipment for paddleboarding is the leash. It’s easy to underestimate your exhaustion and find yourself unable to swim or float. You could also get your head banged by your board and perforating your eardrum, causing vertigo and losing the ability to know which way is swimming up. A strong and durable paddle board leash can show you which way is up to the surface when you are submerged. You can also bring your board back and use to keep you afloat when injured. Whatever the reason is for you to paddle board, being out in the water means difficulty getting help in a timely manner. A leash keeps your board close enough to you so you can use it to stay afloat during a crisis. In this guide, we look at the top 3 SUP leashes, for ankles and calfs, that will keep you and your board together. 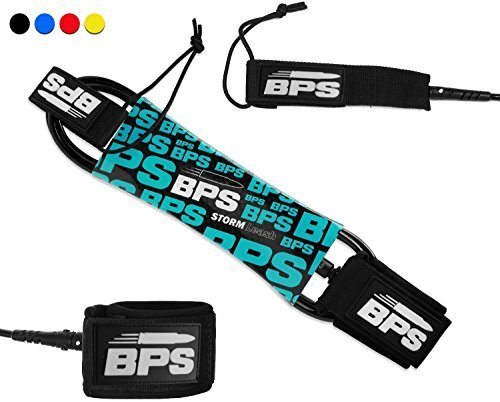 The BPS Storm Leash is a multi-color 10′ coiled leash with a cuff made from padded neoprene material for waterproof comfort. The cord is 7.2mm thick, with double stainless steel swivels and triple wrap rail saver. This leash can stretch up to 5 times its coiled length. BPS Storm also has a straight leash to choose from. 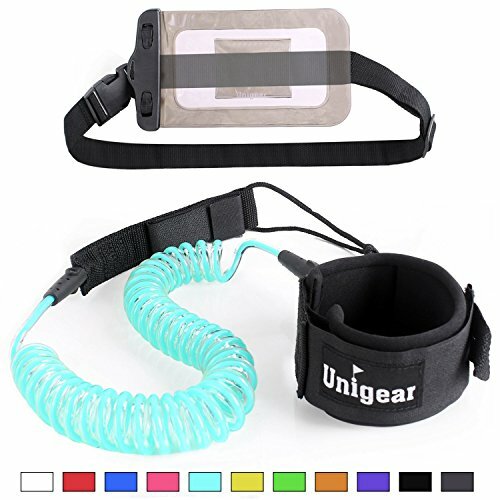 The Unigear Leash is a 7mm thick urethane coiled leash, made of TPU elastic polyurethane with soft sponge for comfort. It uses molded-in double stainless steel swivels and a triple wrap rail saver to stick around during the tough times on the water. When uncoiled, it stretches to a maximum length of 10 feet. The leash also comes with a waterproof case with an adjustable waist belt. There is also a nice bonus of a hidden key pocket pull tab on the ankle cuff velcro. Unigear also has a straight leash for those who surf in choppier water. The DaKine Leash is a 8mm urethane cord with double stainless swivels for durability and triple wrap rail saver for security. 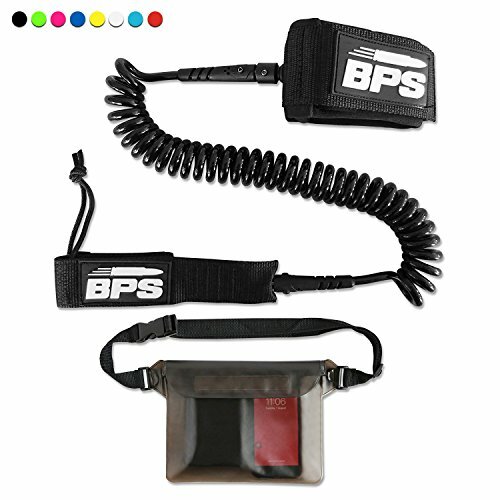 It comes two lengths 10″ for coiled or straight leash and 12″ for straight leashes only. The cuffs use molded neoprene material for comfort and a posi-lock hook and loop closure. 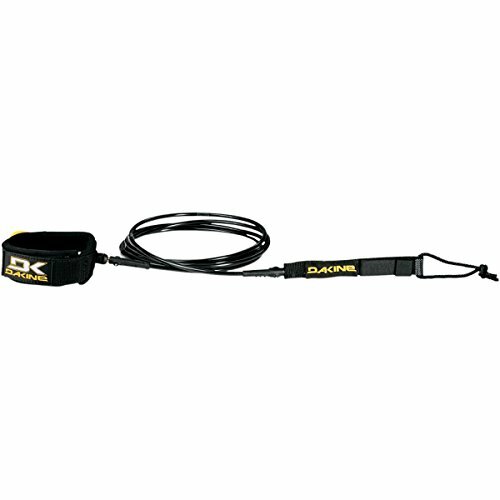 The DaKine also uses a marine grade stainless steel swivel and Opti-Flex leash ends. The rail saver is the piece that attaches to the board. The cord keeps the rail saver attached to the cuff. The cuff goes around your ankle. The rail saver should be adjustable, to give you the movement you need to maneuver on your paddle board deck. Choosing a type of leash depends on the body of water you are on. For calm, flat water, a coiled leash is great to pull your board back to you. In choppier water with waves, the coiled leash can be dangerous so a straight leash is best. A good rule of thumb on picking the right leash length is that you should be able to walk to the nose of your board when it’s attached to the tail end. Some paddlers suggest a leash that is up to an extra foot longer than your board to ensure the board doesn’t catch you in the head or your board’s fin in the chin. For example, if you have a 7″ board, then your leash should be 7″ to 8″ long. How Do You Attach Your Paddle Board Leash? Part 1: Attaching the leash to the board. Not sure which ankle to attach your leash to? Stand on your paddle board and pretend you’re surfing the waves. Whichever leg is in the back of your paddle board is your dominant leg. This is the best leg to attach your leash on! 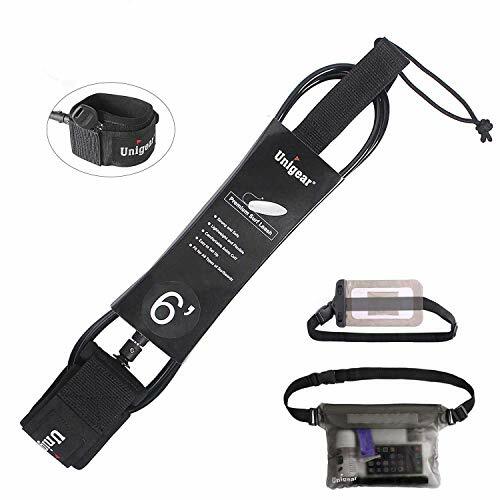 Leashes is one of the most important equipments when SUP boarding. They are an affordable gear that can keep you safe when you are in the water. In this buyer’s guide, we recommend 3 of the best SUP leashes on the market. We hope it serves you well in choosing the safest and strongest leash for you.